The Old Tuam Society cordially invites you to join us in a special programme of events to Commemorate the Centenary of the 1916 Easter Rising. A docu-drama, The Patriot Game, which charts the events of the Easter Rising, 1916, was written by Tuam native Tom Murphy. The play was originally commissioned by the BBC in 1965 to commemorate the fiftieth anniversary of the Easter Rising. The television play was never aired. 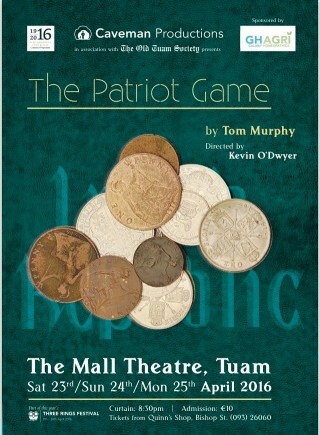 Caveman Productions in association with The Old Tuam Society will present The Patriot Game, directed by Tuam broadcaster, theatre director, and writer, Kevin O’Dwyer, in the Mall Theatre, Tuam from Saturday 23 to Monday 25 April. Curtains at 8-30pm. Tickets available from Quinn’s Confectionery, Bishop Street, €10 each. The Old Tuam Society will host Tuam’s 1916 Commemoration on Sunday 24 April 2016 at 2.30pm, the centenary of the start of the Easter Rising. This free public event is a formal commemorative event in partnership with Galway County Council, remembering and honouring those who took part in the Easter Rising. It will take place at the restored 1916 Monument on Bishop St. followed by light refreshments afterwards. This monument, first unveiled at the 50th Anniversary commemoration in 1966, is currently being restored on behalf of the Society. The restoration involves replacing the handcrafted metalwork missing from the monument and a new commemorative centenary plaque will also be unveiled at the base. The Society is honoured to welcome Cathaoirleach of County Galway Cllr. Peter Roche and descendants of Irish Volunteer and Fianna Éireann leader Liam Langley, Cloonthue, Tuam, who will lay a wreath. They will also be joined by families of local Volunteer and War of Independence veterans. The presence of the families is particularly significant as many of their ancestors were present for the original unveiling of this monument. The Community Support Unit of the Dept. of Defence has granted members of the Defence Forces to provide a Colour Party and Military Display at the event. We are also honoured to welcome members of the Irish United Nations Veterans Association (IUNVA), and Tuam Fire Brigade among others. Dave Swift of Claíomh, Irish Living History, will read the final two statements of Éamonn Ceannt, he will be in full Commandant IV uniform with arms and insignia. He will be accompanied by a Cumman na Ban interpreter in full uniform. The Jubilee 1916 Monument at Bishop Street, Tuam, was unveiled on December 18 1966 and designed by Old Tuam Society Member Willie Mannion, who worked for Galway County Council at that time. The memorial originally bore brass numbering ‘1916-1966’, with the symbol of the Sword of Light in the centre and was topped with a gilded capstone depicting the Gal Gréine or Sunburst emblem. Willie Kelly, Stonemason, Bishop Street, built and erected the monument, which was built using local stone and also included a stone from every county in Ireland in the base, which added to the significance of the monument and reflected the idea of a united Ireland. 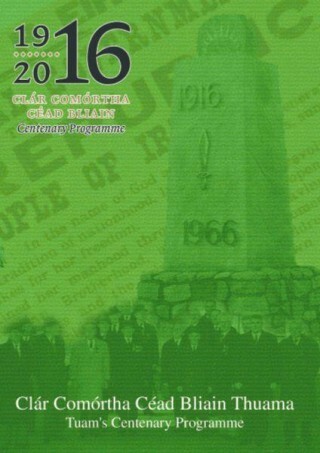 We are delighted that his son Liam has carried out the restoration work for the Centenary commemoration.